A 5-star hotel from the boutique collection of the renowned Accor chain, developed from three 16th century historic houses that once belonged to the first Spanish Governor. The hotel is in the colonial quarter surrounded by the major tourist attractions of the city. A recently built luxury hotel atop a high-end shopping mall housing the better known international fashion brands. The tall building affords open views of the city from the terrace of its popular bar. Enjoy the elegant rooms, fine dining and the roof-top swimming pool. With spectacular ocean views, the hotel offers from vast first-class recreational options, like tennis, open-air swimming and luxury spa treatments to gourmet cuisine. The perfect place to explore the city's fascinating history, its shopping, and nightlife. Hotel and casino in the elegant quarters of the city, close to its historical centre. Semi-olympic swimmig-pool, large fully-equipped gimnasium, sauna, Turkish baths, 7 tennis courts, soccer field and basktetball court: the perfect destination to keep fit. In the tallest building of the city the all-suite hotel run by Hilton forms part of an upmarket complex for fashion and accessory shops, restaurants, and many other interesting outlets. Very central for the business district and within easy reach of the historic quarter. Centrally located for easy access to the historic quarters, business districts, shopping and entertainment areas. With own restaurants and bars, swimming pool, spa, and fitness center it is a relaxing haven after a day of exploration or work. 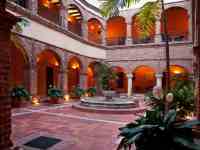 A Unesco listed, small romantic boutique hotel (19 rooms only) in the historic Colonial Zone offers the charm of the old Spanish-style buildings of the area. It boats an outstanding French gourmet restaurant with its own outdoor patio. The iconic El Embajador is in a residential area close to shops and businesses. It is ideal for business or leisure and will captivate guests with attentive and personalized service. There are recently remodelled with new rooms, lobby, and a great atmosphere. With its history and refined Caribbean allure, the Renaissance Jaragua Hotel & Casino offers a unique brand of traditional service and contemporary style. Our Jaragua hotel offers all inclusive packages for an unforgettable Santo Domingo vacation. Located in downtown Santo Domingo, it is a hotel with great tradition and prestige that has been completely refurbished. Relax in the pools, or enjoy the views of the city from hotel's terrace. Work out in the gym, or indulge in the spa treatments. Located in the heart of the business district, the hotel boasts a convenient location and quality amenities at a price you can afford. Our outdoor pool on the eighth floor, offers stunning city views. Otherwise, enjoy the Aromas Restaurant, or unwind in our Bar & Lounge. 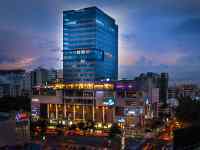 The hotel is located in the heart of the city's cultural district and offers comfortable accommodations and complete services for business and leisure travelers alike. Enjoy our restaurants, or relax and unwind at our outdoor swimming pool and fitness center. Right in the center of the Old Town, close to the main attractions of this historic city. A well-priced hotel from the well-known French hotel chain. The hotel offers all basic facilities with a restaurant with some tables outside in the picturesque pedestrian street.